On December 14th, 1961 Leland Bushong of the Logan Realty Company announced a new golf course to be built three miles south of Van Wert. After several months of investigation and research, Bushong & his associates estimated the course to be completed and ready for play by June 1963. It would be called The Edgecreek Golf Course and would be laid out on the former Stoops farm, owned by Paul Wise & Geore Moore. The first 9 holes of the course were to be 3,275 yards long, the shortest being 150 yards. Of the 160-acre farm, 133 acres were incorporated into the Edgecreek Golf Course with a nine-acre tract reserved for parking. Along Walnut Street, on the east side of the farm, 18 acres were set aside for residential development. A gently rolling farm, it was considered some of the best productive land in Van Wert County. 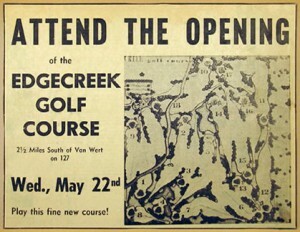 The course had it’s formal grand opening on May 22nd, 1963. Free golf was available to men that day, and to women the following day. “We are pleased with the public response to this new recreational facility… and the patronage at the Edgecreek Golf Course has exceeded our expectations,” said Lee Bushong. Daily attendance on the fairways averaged over 100 with higher figures on the weekends. Edgecreek started off with a Normal 0 commodious clubhouse, a golfing equipment store, and a snack bar, and offered opportunities for both the serious-minded golfer and the occasional golf enthusiast. Edgecreek became very popular and was visited by Paul Hahn on June 25th, 1964. Hahn put on an act filled with comedic golf stunts and humor to go along with it. His act featured a 90-lb golf bag, holding numerous 2-lb clubs with rubber shafts made of garden hose. These shafts were six feet long as compared to the compared to the average driver of 42 inches. Over the years Edgecreek has changed its name a couple of times. Once to Woods Golf Course, and most recently to Hickory Sticks Golf Club. Inspired by the hickory sticks that golf clubs were once made of, this change is an effort to get back to an old style golf course feeling.